More and more seniors are using CrossFit to ensure the golden years are rich with vitality. Marty Cej reports. First, Lu Quast talks about about the cancer and the knee surgeries. Then she talks about about the back injury, which happened first but so long ago the accident can be told with a smile slipping into her voice. She fell from a ladder when painting a ceiling. She picked herself up and carried on but was left with chronic back pain for years afterwards. She can’t remember exactly when she fell because it was more than 40 years ago, and since she began focusing on her deadlift, squat and kettlebell swing, the pain is a memory, too. Quast, who turns 78 on Feb. 19, is almost certain she’s the oldest athlete at Bayou City Crossfit in Houston, Texas. “I am not breast cancer,” says Liz Anderson, co-owner of CrossFit Blaze in Naples, Fla. She has been battling breast cancer for two years, and CrossFit has helped her find the strength to fight. Great article. It talks about some of my favorite aspects of Crossfit. Thanks for the quote also. Glad to see others enjoyed my musings. I like to think that seniors are embracing Crossfit, but when I visited 5 boxes in my area, they all say the same thing. Seniors don't train, even with the massive numbers out there. Of the "boomer generation" of close to 500 million and growing, 85% of this group do not do any kind of exercise. I belong to a military vet club of 80 members(WWII,korea,and Nam vets), I am the only one who does any kind of exercise. I am the "freak" in the group. I think seniors resign themselves to description as part of the ageing process and wait for god to take them. After a number of years as a personal trainer, I give up on my age group as the are the lowest demographic for fitness clients, yet the biggest volume. That was a great article and I am inspired by these people. I agree with Ken Wilson, I too feel like the "Lone Ranger", I am 66 and have been exercising for lets just say a long time. I am a Level 1 CF trainer, cert. by ACE and Underground Strength and I embrace the CF attitude and methodolgy as being second to none. I, now having read this article will be seeking out a box near me. I have my own small training facility but I need coaching and inspiration that I both physcially and mentally cannot get by myself. That article pushed me over the edge of contemplation and on to the playing field. If the other "Baby Boomers" knew what the very few of know already the "box" population would explode. I will turn 60 next week and have had a few challenges during my 2 plus years at Crossfit. A broken ankle with high ankle sprains (box jumps) and recent lamonectomy disectomy surgery. Also have stage four liver disease and Hep C.
I have often wondered if this was just to aggressive a model for me as I continued to return to Crossfit to train. However way down deep I have always believed that if I scaled appropriately and didn't try to match the kids in reps or weight that the Crossfit model was making me stronger and healthier. I feel that I am now an equal partner in my healthcare as well. I love that its not so much the PR's (although great) but the willingness to fail that we find so attractive in each other. It's the struggle that we can all relate to in one another.It's the heart Crossfit challenges the most. An excellent article, but I would like to have heard more about how CrossFit can help all those older folks understand that they are able to undertake a fitness program. I am 70 and have tried to remain fit & healthy most of my life because I saw problems in my family. I have been doing my version of CrossFit for over 5 years and know I am in much better physical condition than many my age. People who have never worked out, who do not understand the science behind exercise and fitness are very intimidated by young people who work out. It doesn't matter whether they see them on the local playground, in a globo gym, or a CrossFit box. Hell, I've seen university fitness centers that are afraid to set up a CrossFit area because they worry about liability. More articles helping someone who has never exercised understand how they can get started and how they can scale the WODs would be very helpful. The book "Younger Next Year" and, more recently, "Thinner This Year" are examples of easy to read guides explaining to older folks why it is important to exercise. I do realize, of course, that even if many people are handed such a book they will never read it. For those who do, however, it can make their lives healthier, happier, and richer. I also enjoyed this article. I'm 61, and this is my 3rd year doing CrossFit. On my first day in the box, I was asked what my goals were. I responded that my first priority was not to get hurt. I takes too long to recover. I've been mostly, but not totally, successful. At the moment I have some kind of low back thing going on, and pain in both elbows, which I believe is resolving. The source of the back pain was a long drive to Canada, not CrossFit. I think the elbow pain may be related to wall balls, probably resulting from poor form on the catch. Everyone in the box wants to do well, Rx the WOD, minimize the scaling, and this includes seniors. I wonder if more seniors would participate if the themes of safety and injury avoidance were given as much emphasis as speed, time, weight, etc. I think it is likely that seniors who are not actively guided and encouraged to be conservative, use their own judgment, and to not feel embarrassed or reluctant to put the brakes on sooner rather than later, might have a more successful experience. Like all the other writers, I appreciate and enjoy all the benefits that CrossFit has provided. Great article would love to see more articles from wise people in their 60's. I just started CF at 63 can't believe the difference in 3 months! Would love to hear from other women doing the same! 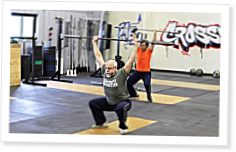 Hi, I am 58 and one of the senior athletes at Fort Mill Cross Fit in Charlotte NC. I have been going for 6 weeks now and my coaches are kind, gentle and most of all, supportive. I was scared to start, but I am so happy I did. I don't know what you are going through as you read this, but if you want something that can change your life, this will. The programs are modified for you according to your needs and you will see results and then you too will be hooked. I have been doing Crossfit since February last year. I am now 72 (male) and still love it. After a 6am class I feel like a well oiled machine!! It was difficult at first because every day was different meaning little repetition to learn. Now when I see the WOD I instantly know what i can do and what needs to be scaled. e.g. T2B = V-ups. For everything I can't do there is something I can do well. GHD situps for example. Just keep going and the the impossible becomes possible.